When evoked, this spirit appeared in a battle stance and brandishing a sword. Andras, who looks more like an insect than the angelic appearing entity the old magicians described, does not seem to be a being I would want to meet on a battlefield or in a dark alley. The mystics said Andras "appears as an angel with a raven head." The only thing slightly angelic about this demon is that he has wings. His head does not seem to look like that of a bird, but then to each their own. It was said he always rode a wolf and carried a sword in his right hand. 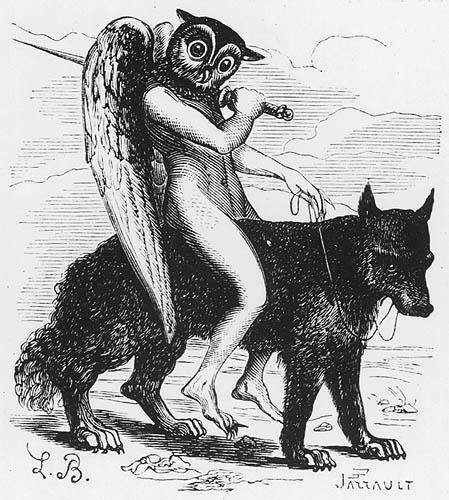 Well over a century ago, Collin de Plancy wrote that Andras rides a black wolf and has the head of an owl. As the sixty-third Spirit of the Goetia, he is ranked as a grand marquesse who commands 30 legions of demons. He likes to escalate quarrels and discord where ever he appears. If you don't believe that Andras is a mean spirit, read the following words, penned by S. L. MacGregor Mathers: "Andras sows discord and may slay the invoker and his fellows. I suspect this is why there is so little known about Andras. There were few magicians who evoked him and lived to tell about it.